E. I. Du Pont De Nemours & Company (DuPont) is a diversified global chemical, agricultural and biotechnology corporation with headquarters in Wilmington, Delaware. It is one of the "Big 6" Biotech Corporations, along with BASF, Bayer, Dow Chemical Company, Syngenta, and Monsanto (so called because they dominate the agricultural input market -- that is, they own the world’s seed, pesticide and biotechnology industries). The company also manufactures and markets consumer products and services in the areas of nutrition, electronics, communications, safety and protection, home and construction, transportation and apparel. It is one of the world's largest chemical companies, with facilities in over 70 countries. Dupont is the third largest chemical maker (after Dow and ExxonMobil Chemicals) in the U.S. The company operates through five divisions: automotive finishes and coatings; agrochemicals and genetically modified (GMO) seeds; electronics (LCDs, sensors, and fluorochemicals); polymers and resins for packaging; and safety/security materials (under brand names like Tyvek, Kevlar and Corian). In the last decade, DuPont has divested some of its operations. It no longer produces pharmaceuticals and has spun off its fibers operations as well. The company's main focus is now biotechnology and safety/protection. DuPont has been a corporate funder of the American Legislative Exchange Council (ALEC). See ALEC Corporations for more. A DuPont executive sits on the board of the HR Policy Association (HRPA), a trade association. HRPA is a major opponent of the Fair Pay and Safe Workplaces Executive Order, an order issued by President Obama in 2014 that aims to ensure that federal contractors comply with federal wage laws, health and safety standards, and civil rights laws. An investigation by the Center for Media and Democracy of OSHA inspection records found that numerous corporations (and/or their subsidiaries)--including DuPont--whose executives sit on the board of HRPA had been cited for serious and repeat violations of OSHA standards from 2013-2015 that would be reportable under the EO. A "serious" violation indicates "a substantial probability that death or serious physical harm could result" from a hazard, a "willful" violation is cited when "evidence shows either an intentional violation of the Act or plain indifference to its requirements," and a "repeat" violation indicates the business "has been cited previously for a substantially similar condition." Over recent years, DuPont and/or subsidiaries have had multiple federal contracts with the Department of Defense, the Department of Agriculture or other federal agencies. The multiple Serious, Willful, and Repeat violations include citations for infractions of safety rules related to four worker fatalities in 2014, some of which were still found to be in violation during a follow-up inspection in 2015, as described below. Some citations are being contested by the company. Recent OSHA citations (May 5, 2015 and April 28, 2014) also include violations under the lockout/tagout regulation that was referenced after a 2010 worker death in Buffalo, New York (see below). 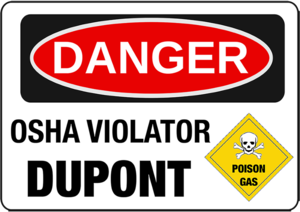 In May 2015, OSHA cited DuPont for a hazardous gas leak in November 2014 that led to the deaths of four workers at DuPont’s La Porte, Texas plant after what OSHA characterized as "serious failures" by DuPont. An employee collapsed when 20,000 pounds of gaseous methyl mercaptan leaked into the enclosed space where she was working. Three other employees, including two brothers, were killed one by one by the toxic fumes while trying to rescue her and each other. OSHA issued DuPont 1 “Repeat” and 9 “Serious” violations for failing to train its employees about the ventilation system and use of respirators, as well as a fine of $99,000. The violations are under contest by the company. “Four people lost their lives and their families lost loved ones because DuPont did not have proper safety procedures in place,” Assistant Secretary of Labor for Occupational Safety and Health Dr. David Michaels said of the incident. 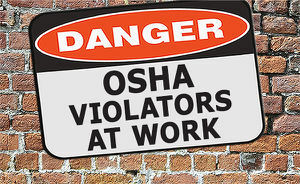 “We have concerns about the safety culture,” OSHA’s Michaels told the Texas Tribune. “We expect chemical facilities where highly toxic materials are used to have a culture that focuses on ensuring worker protection. It appears to have broken down.” Michaels noted that the fines were "petty cash" for a corporation with approximately $35 billion in annual revenues. The violations are under contest by the company. In May 2014, a chemical leak from a tanker truck exposed workers to hazardous chemicals at the DuPont Chamber Works plant in Deepwater, New Jersey. An inspection in response to a complaint led to OSHA issuing 11 violations and initial penalties of $120,300 to E.I. du Pont de Nemours & Co., Chamber Works. OSHA inspectors cited the company for eight “Serious” violations under the process safety management standard. In addition to the Serious violations, the company failed to perform an analysis addressing hazards related to the storage and transport of chemicals. DuPont Chamber Works also did not perform inspections and tests on the equipment used in chemical processes, resulting in 2 “Repeat” violations, as the company was previously cited for these same violations at other facilities in 2010 and 2011. One “Other-than-Serious” violation was cited because the company failed to address issues relating to hazards promptly. The violations are under contest by the company. While violations occurring in 2010 would not be reportable under the terms of the Executive Order, as they are outside the three-year look-back period, the two fatal incidents described below provide background and context for DuPont’s subsequent reportable violations, including the recent fatal accidents in 2015 in La Porte, Texas. On January 23, 2010 a DuPont worker was sprayed in the face with hazardous phosgene, an herbicide that was used as a chemical weapon in World War I, after a hose ruptured in a storage area in DuPont's Belle, West Virginia plant. The man was taken to the hospital, where he died the following night. The phosgene release was the third hazardous chemical release in two days at the plant. An investigation by the U.S. Chemical Safety and Hazard Investigation Board (CSB) found problems with DuPont's use of automated safety software, communication with emergency crews, and equipment maintenance. In July, 2010, OSHA announced that it had fined the company $43,000, citing it for 6 “Serious” and 5 “Other-than-Serious” violations, including the company's failure to properly inspect piping used to transfer phosgene, perform a thorough process hazard analysis for its phosgene operation, train workers on hazards associated with phosgene, thoroughly inspect all high-risk sections of piping used to transfer oleum, and properly install energized electrical conductors. The case closed in August, 2010 and the penalties and citations were sustained. A storage tank at DuPont’s Yerkes facility in Buffalo, New York exploded on November 9, 2010 due to an undetected leak of flammable vinyl fluoride, killing one worker and causing first-degree burns in another. The Chemical Safety Board, which produced a safety video based on the incident, called the accident “preventable” and identified problems with DuPont's monitoring of flammable vapor. After a separate investigation, OSHA announced on May 5, 2011 that it had cited DuPont and a contractor for a combined total of 17 “Serious” violations, and $61,500 and $55,440 in proposed fines, respectively. The case was closed in February, 2012, after an Administrative Law Judge sustained 7 of the Serious citations against DuPont and a fine of $49,000. DuPont spent $10,241,668 on direct lobbying in 2013, and 11 out of its 19 in-house lobbyists previously held government positions. This is up from $4,877,684 in lobbying expenses in 2012. Glover Park Group $60,000 Competition in agriculture and Farm Bill legislation. Van Scoyoc Associates $30,000 Issues regarding Housing; and Lead Paint Remediation: Transportation, Housing and Urban Development, and Related Agencies Appropriations Act, FY2013, Public Law 112-55, Consolidated and Further Continuing Appropriations Act, FY2012. As of the first quarter of 2014, the DuPont Co. PAC had made $140,125 in political contributions to federal candidates. During the 2012 election cycle, DuPont made $364,981 in contributions to federal candidates. Top recipients included Barack Obama (D), Pat Roberts (R-KS), Tom Carper (D-DE), Mitt Romney (R), and Tom Harkin (D-IA). The DuPont Company Good Government Fund, a PAC, has raised $288,373 and spent $205,163 for 2012 elections, and its most significant contribution went to Pat Roberts, ranking member of the Senate Ag Committee. E.I. du Pont de Nemours and Company was founded in 1802 on the banks of the Brandywine River near Wilmington, Delaware by french chemist Éleuthère Irénée du Pont de Nemours. The company began life as a partnership in gunpowder and explosives. By 1811, it was the nation’s largest gunpowder manufacturer. By the time the company incorporated in 1902, it controlled 36% of the U.S. powder market. By 1905 it held a 75% share. DuPont alone was responsible for 56% of the national production of explosives. With $60 million in estimated assets, it was one of the country's largest corporations. In fact, DuPont became so dominant that the government initiated anti-trust proceedings in 1907. In 1912, the company was deemed a gunpowder monopoly and ordered to divest a substantial portion of its business. Despite the streamlining, DuPont still managed to supply 40% of all explosives used by Allied forces in World War 1 (1.5 billion lbs). DuPont gradually diversified in the early 20th century. Experiments with a product known as guncotton, an early form of nitroglycerine, led to involvement in the textile industry. After World War 1, peacetime use of artificial fibres proved more profitable than explosives. In the 1920s DuPont acquired the rights to cellophane from a French company. DuPont researchers produced a moisture-proof cellophane, which transformed it from a decorative wrap to packaging for food and other products. Also in the 1920's, DuPont acquired General Motors and entered into a 50-50 joint venture with Standard Oil (now Exxon) to produce and market the lead additive in petrol (known as ethyl). The new company was called the Ethyl Corporation. Economically, the company’s most important discovery was Nylon. Nylon was originally created in 1930, by a polymer research group headed by Wallace H. Carothers. A large number of synthetic products followed, including Lucite (a clear, tough plastic resin), Teflon (resin used in non-stick cookware), Butacite PVB interlayer (plastic used in automotive safety glass). For a full corporate profile, see also Dupont De NeMours and Company. Under current policy, the government provides large subsidies to farmers to produce grains, in particularly corn and soybeans. Livestock producers use corn and soy as a base for animal feed as they are protein rich and fatten up the animals. They are also cheap (due to government subsidies.) Livestock consumes 47% of the soy and 60% of the corn produced in the US. See also Food and Drug Administration. In March 2002 then-West Virginia Department of Environmental Protection spokesman Andy Gallagher drafted a media release to inform residents in Wood County, West Virginia, that the toxic chemical C8 (also known as PFOA) was in air emissions from DuPont's Parkersburg plant. In a deposition as part of a class action suit by residents Gallagher stated that Dee Ann Staats, a toxicologist working as the departments' science adviser, insisted that all statements relating to C8 emissions were to be vetted by DuPont. Gallagher's testimony, obtained from the federal Environment Protection Agency under the Freedom of Information Act, reveal when Gallagher issued the statement without the approval of Staats or the company, DuPont went all out to kill the release. A DuPont PR official, Dawn Jackson, contacted Ann Bradley, a lawyer with Spilman Thomas & Battle who represent DuPont. After lobbying from the company, Gallagher withdrew the media release. DuPont ranked number one in the Political Economy Research Institute's top 100 air polluters in the U.S. for 2002. In December 2011, a three-person team of scientists said they found a "probable link" between C8 and high blood pressure among pregnant women. It was the first major conclusions of a six-year study of the DuPont Co. chemical, part of a class-action lawsuit settlement between DuPont and Mid-Ohio Valley residents whose water was contaminated with C8 by DuPont's nearby Washington Works plant. Panel members said evidence they reviewed was "insufficient" to conclude a probable link between C8 exposure and birth defects, preterm births, low birth weight, miscarriages and stillbirths, but the group said scientific studies show a probable link between chemical exposure and pregnancy-induced hypertension - i.e. high blood pressure among pregnant women who did not have the condition prior to pregnancy. Panel member David Savitz of Brown University said the condition "is certainly a serious complication of pregnancy," which can threaten the health of the mother and the baby. When combined with leakage of protein into the urine, this high blood pressure is an especially serious condition called pre-eclampsia. Three of four analyses of Mid-Ohio Valley residents showed small elevations in pregnancy-induced hypertension or pre-eclampsia among women with the highest C8 exposures, the Science Panel said. August 2006 - the Associated Press reported that the Children's Health Forum was founded by Dr. Benjamin Hooks, a consultant hired by DuPont, "to help the company address childhood lead poisoning." The group was initially incorporated as a lobbying group, but later became a nonprofit charity. Most of the money raised by the group has come from DuPont. Several board members have ties to DuPont; executive director Olivia Morgan works for the PR firm Dewey Square Group, which counts DuPont among its clients. Yet, the Children's Health Forum group claimed to act independently of DuPont. August 2008 - Governor Joe Manchin III of West Virginia filed a friend-of-the-court brief arguing that the State Supreme Court should review a $382 million judgment against the DuPont Company, as part of the largest civil penalty ever levied against the company. A jury in Harrison County, West Virginia, ordered DuPont to pay nearly $382 million to monitor nearly 8,000 residents in the area for signs of cancer, to clean up the site and pay punitive damages for dumping toxic arsenic, cadmium and lead in the vicinities of its local plant. Various documents prove that the governor met with the vice president of DuPont and one of the company’s lawyers to discuss the appeal, as well as with the company's chairman and chief executive, Charles O. Holliday Jr., on Nov. 20, 2007, less than a month after the original verdict. Shortly before the governor filed his brief, DuPont lawyers provided his office with two draft briefs that made many of the same arguments he later used in his brief, documents show. "establish a clear pattern of denial of corporate responsibility. When the harmful conditions that cause accidents exist, these catastrophes at DuPont plants become catastrophes for workers and the public." "In contrast, the USW has tracked data on fatality investigations for 20 years. What we almost always find when we investigate catastrophic accidents, including fatalities, is that multiple root causes related to hazards and unsafe conditions, not multiple unsafe behaviors, cause the accident." Number one producer of toxic dioxins in the U.S.
"We condemn the fact that DuPont received this award, since it appears this company's actions contradict the NSC's criteria." "We felt it was vital that members of the health and safety community understood the truth regarding DuPont's safety record. What this company sells to other corporations and what actually happens at DuPont plants are two completely different things. In fact, we have found many safety folks here at the conference have been sympathetic to our message." A promotional web page on Teflon by Invista, a Koch Industries subsidiary, apparently indicates otherwise. See also Environmental Defense Dances With DuPont On Nanotechnology. Curtis J. Crawford - President & CEO, XCEO, Inc.
Eleuthere I. du Pont - President, Longwood Foundation, Inc.
Lois D. Juliber - Ret. Vice Chairman, Colgate-Palmolive Co.
Philip Mattera, Corporate Research Project, Dupont: Corporate Rap Sheet, last modified October 27, 2013. Nathaniel Rich, "The Lawyer Who Became DuPont’s Worst Nightmare," New York Times, January 6, 2016. Sharon Kelley, "Teflon's Toxic Legacy," Earth Island Journal, 2016. Nicholas Varchaver Chemical reaction, Fortune, March 22, 2007. ↑ Du Pont De Meours and Company SEC Filing, fiscal year 2011. Accessed June 19th, 2012. ↑ Occupational Safety and Health Administration, "Search results: Dupont," inspection case records, database accessed January 2016. ↑ Occupational Safety and Health Administration, "Search results: E.I. Du Pont De Nemours," inspection case records, database accessed January 2016. ↑ Occupational Safety and Health Administration, "Inspection: 1008319.015 - E.I. Dupont De Nemours & Co., Inc.," inspection case record, database accessed January 2016. ↑ Occupational Safety and Health Administration, "Proper protections could have saved four DuPont workers killed by gas: Federal safety investigators find serious failures in 2014 toxic release in Texas," OSHA Regional News Release: Region 6, May 14, 2015, accessed January, 2016. ↑ Occupational Safety and Health Administration, "Inspection: 1019650.015 - E.I. Dupont De Nemours & Co., Inc.," inspection case record, database accessed January 2016. ↑ Occupational Safety and Health Administration, "Inspection: 977332.015 - E.I. Dupont Denemours Incorporated Chambers Works," inspection case record, database accessed January 2016. ↑ Occupational Safety and Health Administration, "DuPont's chemical safety systems inadequate at Deepwater, New Jersey, plant: OSHA cites company for failure to protect workers from hazardous materials," OSHA Regional News Release: Region 2, December 1, 2014, accessed January 2016. ↑ U.S. Chemical Safety Board, "CSB Investigation Finds Three DuPont Accidents in Belle, West Virginia, Resulted from Numerous Safety Deficiencies including Lack of Safe Equipment Design, Ineffective Mechanical Integrity Programs, and Incomplete Investigations of Previous Near Misses ," press release, July 7, 2011. ↑ Occupational Safety and Health Administration, "US Labor Department's OSHA cites DuPont for exposing workers to hazardous chemicals following a fatal accident at the Belle, W.Va., plant," OSHA Regional News Release: Region 3, July 19, 2010, accessed January 2016. ↑ Occupational Safety and Health Administration, "Inspection: 313371924 - E.I. Dupont De Nemours & Company - Belle Plant," inspection case record, database accessed January 2016. ↑ U.S. Chemical Safety Board, "Hot Work: Hidden Hazards," safety video, April 20, 2012, accessed January, 2016. ↑ U.S. Chemical Safety Board, "CSB Releases New Safety Video on Fatal Hot Work Explosion at DuPont Facility in Buffalo; “Hot Work: Hidden Hazards” Shows Danger of Inadequate Gas Monitoring Safety Video Follows Release of the CSB’s Investigative Report ," press release, April 20, 2012. ↑ Occupational Safety and Health Administration, "US Labor Department's OSHA cites DuPont's Yerkes Plant and Buffalo contractor following fatal explosion for welding, hazardous energy violations," press release, May 5, 2011. ↑ Occupational Safety and Health Administration, "Inspection: Inspection: 315004101 - Yerkes Plant E.I. Dupont De Nemours Company," inspection case record, database accessed January 2016. ↑ Center for Responsive Politics, "DuPont Profile for 2014 Election Cycle," OpenSecrets.org political influence database, accessed May 8, 2014. ↑ Center for Responsive Politics, DuPont Profile for 2012 Election Cycle, OpenSecrets.org political influence database, accessed May 29, 2014. ↑ Center for Responsive Politics, DuPont Lobbying Summary, OpenSecrets.org political influence database, accessed May 28, 2014. ↑ Opensecrets: [http://www.opensecrets.org/lobby/clientsum.php?id=D000000495&year=2012 Lobbying Spending Report: DuPont Co.
↑ Center for Responsive Politics, "Profile for 2012 Election Cycle," OpenSecrets.org, accessed May 8, 2014. ↑ Ken Ward Jr., "Panel links C8 to high blood pressure in pregnancy" Charleston Gazette, Dec. 5, 2011. ↑ Former DuPont Top Expert: Company Knew, Covered Up Pollution of Americans' Blood for 18 Years , Environmental Working Group News Release, November 16, 2005. This page was last edited on 18 July 2017, at 17:57.